Elite Nails Hand, Foot and Body Spa: Elite Nails' Valentines Treat for Couples! Elite Nails' Valentines Treat for Couples! Give more than flowers and greeting cards this Valentines Day. A day of rest, a time to indulge in the spa is some of the great gifts you could give your special someone. This Valentines season, Elite Nails spa presents a very loving treat for you and your loved one. Experience one-hour-and-a-half to almost 2-hours of rejuvenating bliss via our Vinotherapy Body Scrub + Combination massage (Package A) and Vinotherapy Body Scrub + Combination massage + Seaweed Facial (Package B). 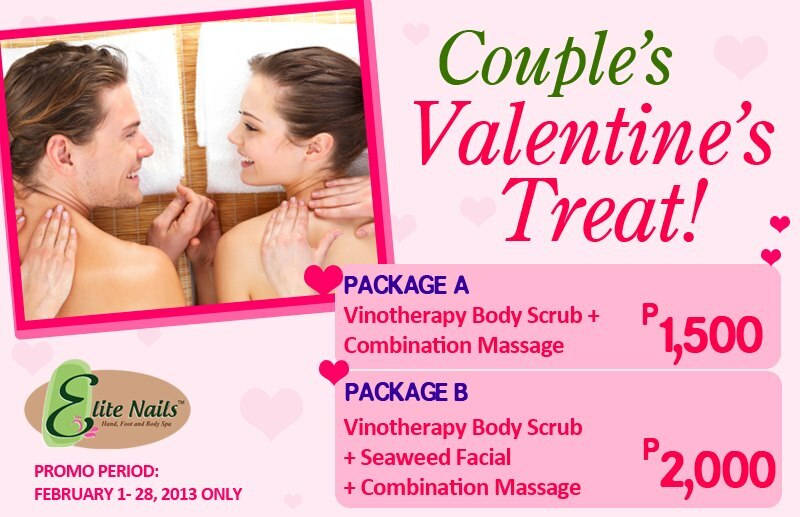 For only P1,500 up to P2,000, you can spend a romantic day spa with us as we give you ultimate pampering experience. Share the love and this exclusive indulgence treat with your family and friends so they could also experience therapeutic pleasure from us here in Elite Nails Spa. For appointment and reservation, you may call these numbers - 09336537276, 09215918801, 09178086950 or at (02) 480-6832. You can also get updates online via our Facebook fan page and at Twitter (@eliteNailsSpa) too.